UTZ Certfied | WHY DO WE LOVE CHOCOLATE? With plant material it is crucial to determine per situation what the best plant variety is and to make sure that it is locally available. The problem is that there is a huge gap between science and practice: scientists are focused on publishing fundamental research and farmers use whatever is available locally. The crux is to apply scientific knowledge locally. 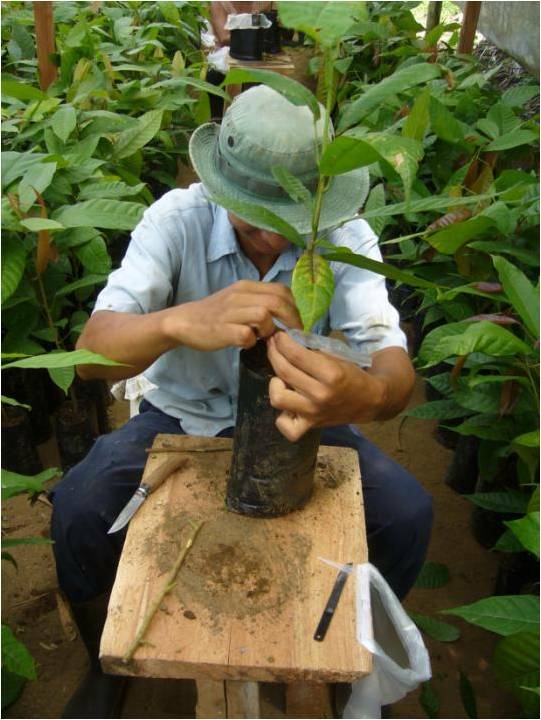 Cocoa production can be increased threefold by using sustainable agricultural techniques, new plant material, and fertilizer. The availability of knowledge on these techniques and the appropriate inputs is generally not perceived as a problem (but requires ongoing investments). A lot is already known and investments are being made in technical research on combating pests and diseases, new plant material, and other topics. This research is mainly conducted outside the Netherlands, by privat R&D departements, specialized cocoa research centres, and universities. Often they work together in the developments of this – more technical- scientific knowledge. The key challenge is how to bridge the gap between this type of knowledge and the materials and knowledge that farmers use on the ground. There is a serious need to make science applicable in local circumstances, and thus to make it more useful for farmers. Training is essential for reaching out to farmers. The central rationale, shared by the different actors involved in mainstreaming sustainable cocoa, is that farmer training increases farmer productivity levels and quality of the produce, ultimately increasing farmer income. It is expected that this additional income will be invested in the well-being of their family members, their cocoa farms, and their communities. This should be lead to the desirable future outcome of cocoa farming becoming an honourable profession, which strongly appeals to the young. Clearly training is an important element, but providing training to millions of farmers and workers is not an easy task. Several key challenges in training smallholders are presented in the next lines: First of all, many farmers lack primary school education so a training program should be practical and connect farmers’ experience and capacities. Second, the infrastructure to train farmers is either lacking or underdeveloped in many cocoa producing countries. Third, local extension services are in many places underdeveloped, which is linked to the limited investment in the cocoa sector and infrastructures from the side of the goverment in many cocoa producing countries. In responce to these difficulties, the cocoa industry and their governmental and civil society partners have decided to organise – in both consumer and producer countries – the farmer training by themselves. The participatory training model that these partners use is the Farmer Field School (FFS) approach. In these schools farmers include pruning, control of pests and diseases, harvesting, fermenting, drying and storing cocoa beans. 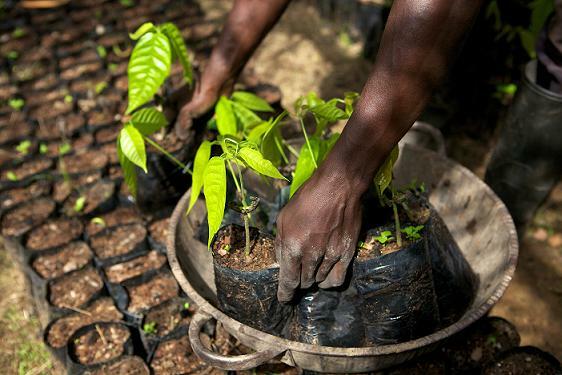 The Sustainable Tree Crop Program (STCP) – and international public-privat partnership between industry, producers, reasearchers, goverment agencies, public sector institutions and conservations groups – has been a major player in setting-up these schools in West-Africa. The intergovernmental organisation CABI, which opened an office in the Netherlands, has played an important role in developing the curriculum of these Farmer Field School for the STCP. Farmer Field Schools are intensive and expensive courses that quickly educate untrained farmers to improve and expand their production as soon as possible. This is an emergency measure and not viable in the long term. Therefore, more sustainable ways of training farmers have to be set up, together with goverments and research institutes. This could be done by linking up with existing structures such as extension services, but alternative ways also have to be explored. Its all about changing the farmrs’ behaviour. Therefore you need training, just as you need inputs, financing, and market opportunities. Effective training, to get people to understand what they should do, has to be done at lowest possible costs in order to be able to reach the mainstream. There are different models with which they are experimenthing; Farmer Field School is one of them. FFS is an expensive but effective manner to train some farmers, but the knowledge that some acquire does not sufficiently trickle down to other. How do you get adults to learn, that’s the challenge. Alternative and additional forms of training are necessary, not only because it is necessary to develop cheaper alternatives but also because of the necessit to increase knowledge dissemination among farmers. Although farmers that receive the FFS training have to commit themselves to train three colleagues, in practice this knowledge dissemination is limited. There are a variety of potential explanations: the farmers have limited capacities as trainers; they do not share knowledge on purpose to retain an advantage over their neighbours; their neighbours could be physically located at a prohibitive distance; and other barriers. To overcome this problem partners in the certification scheme are investing in an additional training model called Training of Trainers (ToT). Farmers that show enthusiasm and progress in acquiring new skills are offered the opportunity to become trainers themselves. They have to follow and additional course and if they pass they receive a certificate that allows them to train other farmers. In order for farmers to receive training they need to be organised. Moreover, farmer organisations are the primary entities that receive certifications. Farmer organisations are able to distribute goods (plant material, fertilizer) and services (training, credit) among their members and act as farmers representatives. Thus organisations have the potential to provide not only economic benefits but also empower farmers. Organisation farmers offers advantages also to industry, by providing support for the certification and auditing process, and by providing a distribution mechanism for inputs, training and finance. There are many different types of farmer organisations. There are small groups of farmers that organise on an informal basis to collectively transport cocoa beans. On the other hand, there are huge national associations, which even have the power to influence national policies. One of the most recognised form of farmer organisation is the cooperative. In many developing counie coopeive wee ceed by govements and consequence wee politicised. Because of past negative experiences, many farmers are suspicious of the cooperative movement and choose not to organise in a formal way. This lack of trust and the additional incentives that are required make it very difficult to organise a group of farmers in practise. This effort is further complicated by the fact that organisations that are founded by external actors tend to set overly ambitions goals or scale up to rapidly. Sometimes the new organisation even conflicts with the existing structures already in place. Also, farmers do not necessarily see the benefits of becoming organised or have no trust. To successfully organise farmers requires providing them with clear incentives. There are also organisations that secure a cooperative status for financial reasons; they primarily use their front as a legal entity and thus do not represent farmer interests. negotiation capacity and have little capital to invest in improving their capacities. To set up new cooperatives or other types of farmer organisation is extremely difficult and it is a serious challenge to reach and organise the overall majority of farmers. next time: Other themes and some reflections. The risk that cocoa suppliers will not be able to meet the required demand is a serious threat to the cocoa sector. The trees that produce cocoa beans are generally old, are rooted in over-farmed soil, and are tended by poor farmers with little if any formal educaton. The majority of farmers are smallholders, which means that they grow cocoa as a cash crop on a small plot of land, along with food crops and occasionally also with other cash crops. From the income generated by these cash crops they pay their hospital bills, debts, their children’s school expenses. Farmers rarely have any remaining financial means to utilise for on-farm investments. Crop losses are a huge problem, as a large portion of the harvest is usually lost to pest and diseases. Money to invest in new plant material, fertilizer or pesticides is lacking; the know-how to apply it is scarce. Farmers often work by themselves and receive little support in terms of training, advice, or access to credit. In this context, exasperated by poor infrastructure and their marginal position farmers sometimes keep their children from school and allow them to help or work on the farm. Because of these appalling conditions, the continuity of cocoa production is under threat. First, there is an exodus from the countryside as youngsters see no future there and seek other possibilities by migrating to the city. Additionally, crops like rubber, cassava, and oil palms have become more profitable for farmers. Cocoa production in West Africa shows a decreasing trend of 2% per year, while, at the same time, demand for cocoa products, including high quality chocolate, is expected to increase in the near future. The cocoa industry is concerned about these developments and faces a majpr challenge: how to assure that supply continues to meet demand. In order to assure that farmers remain in the cocoa business and increase the quantity and quality of their production, industry partners are investing heavily in farmers. Multinational companies have their own initiatives, they are also increasingly collaborating to jointly tackle the problem of supply failure. Not only cocoa companies, but also goverments, financial institutions, NGOs, labour unions and certifiers have been joining forces to provide support to farmers. 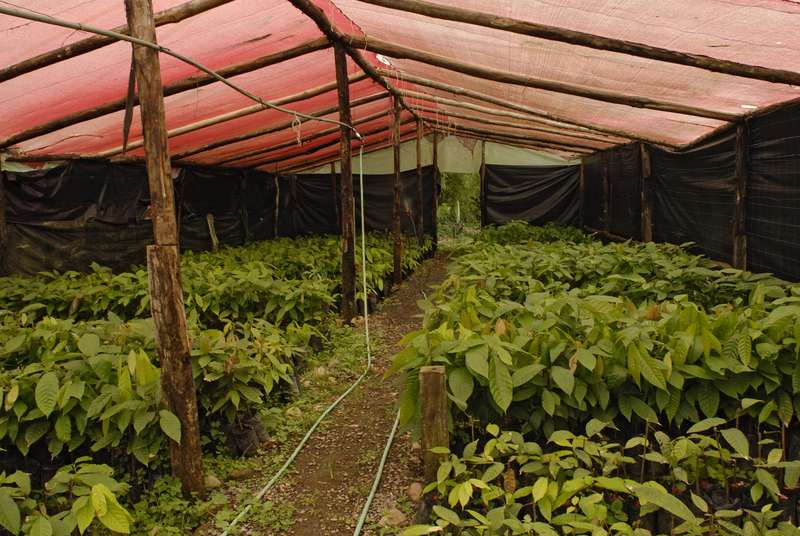 A example of such efforts is the international Cocoa Livelihoods Program. Thhis program focuses on enhancing farmer knowledge, improving farmer marketing skills on agriculturally diversified farms. The Dutch have positioned themselves as leaders in the proces of mainstreaming sustainable cocoa. It is estimated that Dutch companies will invest around $325 million in sustainable cocoa during the course of the next several years (accessed15 July 2010). In the Netherlands a number of industry players have united forces, together with goverment and members of civel society, realise the goal of sustainable cocoa and, addressing the risk of supplier failure, to improve yields and profitability for farmers. One of the results is the UTZ CERTIFIED Cocoa Program, established by several multinational companies. With this initiative they want to at least double the current yields of approximately 400 kg / ha by training farmers in modern farming techniques, using new plant material and increased use of fertilizer. They also want to increase dialogue with authorities to improve enabling factors. The program focuses on the largest producer countries: Ivory Coast, Ghana, Indonesia, Nigeria, Cameroon, and Ecuador. By focusing on capacity building in the source locations and providing farmer training, the program aims to improve the farmers’ productivity and the quality of their produce; which ultimately should be rewarded by the market, under the maxim: ‘Better price for better products’. Chocolat Forever 6 The role of the social movement. The role of the social movement. There is a large social movement in the Netherlands, led by several NGOs, that highlights critical issues in the cocoa chain, such as labour conditions, environmental awareness, or earning a living wage. Such NGOs traditionally oppose industry stakeholders – especially multinationals – due to their strong influence on the cocoa chain. But civil society is increasingly being involved in attemps by industrial players to mainstraim sustainable cocoa partnerships. Solidaridad and Oxfam Novib are the two best known examples. 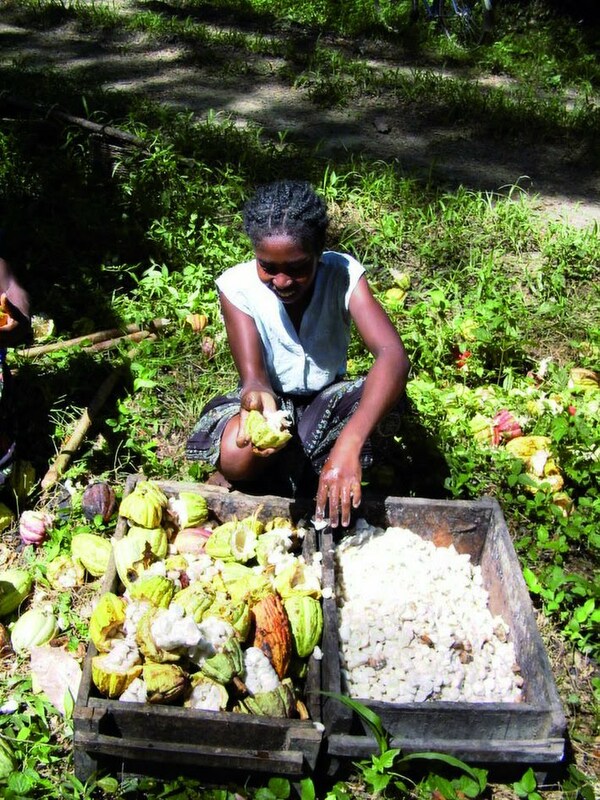 Both NGOs cooperate with industry, for example, by founding the cocoa programme for UTZ CERTIFIED and actively participating in the IDH network. Whereas Solidaridad’s primary focus is on training and organising farmers in origin countries. Oxfam Novib focuses on lobbying and partner support. Both NGO’s are also active in generating knowledge on social and (to a lesser extent) environmental issues and play a role in awareness raising. For example, Oxfam Novib last year started the ‘Groene Sint’ campain, aimed at raising awareness of the abuse that takes place on cocoa plantations. This campain had an impact on supermarkets and larger stores that sell a lot of ‘chocolate letters’ (it is a Dutch custom to give chocolate letters as gift for St.Nicholas day – 5 December). So far, seven stores have committed to sell only fair chocolate letters for the 2010 celebration. Besides Solidaridad and Oxfam Novib, there are some other examples that illustrate the social movement, such as the Tropical Commodity (TCC) and Fair trade certifier Max Havelaar. TCC brings together different stakeholders in conferences and gives an annual overview of the progress made in the different sectors. Max Havelaar is another example of a development oriented organisation that actively engages in the cocoa sector and tries to reshape it by bringen Fairtrade products on the market. As stated, these organisations bring forward a number of critical, largely overlapping issues. The main themes of their work are scalling up sustainable production and involving and supporting farmers in the sustainability debate. Both organisations play an important role in lobbying and raising awareness, not only on level of consumers but also with producers from their target group. TCC advocates the participation of producer organisations in sustainability denate, for example at conferences. It also facilitates roundtable meetings in producing countries (e.g., Gahna, Ecuador, and Indonesia) where all stakeholders can interact. Through these meetings, producers get better acquanted with each other and can learn from each other’s experiences. It also helps them to get their ‘voice’ heard at international round table meetings. Redefining the Dutch knowledge position. With all eyes now focused on sustainability issues in the cocoa chain, a major shift is taking place. A more diverse set of actors is beginning to play a role in the sector and there is a change in the kind of knowledge taht is being developed in the Netherlands. Over the recent years, the Netherlands has developed a thorough knoledge base related to development of sustainable agricultural value chains. This knowledge base covers a wide range of products and different parts of the chains (e.g., production, processing, trade, marketing, etc.) but also addresses integral matters (such as agro logistics, tracking and tracing, bridging demand and supply, bridging theory and practice, ect.). Furthermore, the intense dialogue between companies, civil society and goverment has further enriched stakeholders with knowledge and experience, in particular regarding coping strategies for sustainability in terms of consumer responses. The next chapter examines some of the key challenges involved in sustainable cocoa production, specifically by looking at the role played by Dutch knowledge partners. Chocolat Forever 5 Different roles in knowledge development. Different roles in knowledge development. Over the years a variety of stakeholders, has come together on different occasions, in and outside the Netherlands, to discuss and exchange ideas on sustainable cocoa. Individually these different actors also play a role in knowledge development. Some play regulatory and coordinator roles while others lobby to increase the awareness of social and environmental issues in value chains. The role for universities is mainly to conduct fundamental research, while consultants provide practical knoledge that is directly applicable for their clients. In addition to the difference in role, the underlying motivation to promote knowledge development also differs: the private sector is primarly concerned with optimising their business and securing a good reputation; NGOs are mainly driven by societal concerns; and the goverment is eager to strengthen its innovative power and promote the Dutch knowledge economy. Let us took briefly at the different roles. Traditionally the private sector has played an important role in knoledge development on cocoa processing, effective means of transport, and other related topics. (A well-known example is the invention of the cocoa press by the Dutch chemist and chocolate maker Coenraad Van Houten; the treatment known as ‘Dutching’. )* The cocoa cluster – where the cocoa companies also organise logistics such as transport and storage – has created a competitive and cooperative environment around the Port of Amsterdam. In this innovative climante learning is essential. The Private sector is also an important gatekeeper of knowledge on cocoa production processes. To secure large quantities of good quality cocoa at affordable prices is a core interest. This requires investments in upgrading the product and production process in cocoa producing countries and in knowledge development on these issues. Partly private companies invest in their human resources for knowledge development and invest in their R&D unit. Partly they invest in knowledge on, for example new plant varieties, new ways of combating pests and diseases that can affect cocoa production, etc. In the UK this situation led to strong link between research institutes and industry; in the Netherlands however, this link is rather weak. The Ditch have a tradition of innovation. The Dutch goverment is very keen to strengthen the Netherlands’ powers of innovation and promote its knowledge economy. This focus is important, as innovation has proven to be instrumental in achieving economic prosperity. With the establishment of the Dutch Innovation Platform in 2003, the Dutch goverment ackknowledged this tradition of innovation and recognised its importance. The public sector has several important roles in knowledge development, by providing key investments in education, knowledge, innovation and enterprise. The goverment also plays an active role in knowledge development on sustainable cocoa chains. As mentioned earlier in this study, it is a key driver behind recent multistakeholder initiatives…. The Dutch goverment has also positioned itself as an important fundingagency for international research on sustainable cocoa. Thanks to the sustainable cocoa subsidy, provided at that time by the LNV with the aim to foster sustainable cocoa production and cocoa chain, the Dutch are seen internationally as a key driver behind knowledge development. The LNV provided a subsidy that stimulated the sustainable development of cocoa and chocolate sectors for a period of four years (2004-2007). This subsidy was derived from the Dutch part of the revenues generated through the sale of the cocoa buffer stock. This stock has been accumulating since 1974, when the Netherlands became involved in several International Cocoa Agreements. The rationale behind this stock was that by jointly buying or selling cocoa countries would be able to maintain a stable price on the world market. Because of the limited effect of this system and liberalisation of trade, it was decided to liquide the stock in 1993.
reduction of the environmental impact of the sector. Types of activities eligible for this subsidy include research and development; general information supply; edudation, training and technical assistance; and investment. In addition to subsidies, also regulation stimulates innovation in the Netherlands. Dutch laws and regulation are strict, which contributes to fostering a climate of innovation. The next chapter, covering innovation in the Harbour of Amsterdam, will give some samples of how the key players perscaive these subsidies and regulation and will discuss their impact on knowledge development. Chocolate Forever 4 Does a Dutch knowledge base on cocoa still exist? How can you speak of a Dutch knowledge base in a sector that is inherently international? The large economic importance of cocoa for the Dutch economy, and the prominent role of the Dutch in the international cocoa chain, demands a strong knowledge infrastructure, one able to support the dynamic character of the cocoa cluster. According to a study (2007), despite the Netherlands important position, the Dutch know-how is evaporating. There is no knowledge infrastructure that supports knowledge development specifically on cocoa. Three questions pop-up: first, is this really the case? Second, is this a problem, considering the fact that the cocoa sector is inherently international? And third, what is the Dutch position in the international cocoa chain in terms of generation and sharing of knowledge connected to sustainable cocoa? This last question is important, as the development of sustainable cocoa chains demands not only knowledge on cocoa, but also on sustainability issues and their mutual relationship. Dutch companies occupy a strong position on the international market, where they import and export, produce and process a wide range of agriculture products. At the same time, the Netherlands serves as a major trading and logistical hub in Europe and as a sresult is often dubbed the Gateway to Europe. These large trade-flows primarly pass through the ports of Amsterdam and Rotterdam. The combination of the Dutch playing a central position in the international trade and the trend towards developing sustainable value chains helped the Dutch build a wide range of experiences with sustainability initiatives in a number of agriculture value chains. Another consequence is that the Dutch accumulate a lot of experience with developing certification schemes and creating transparency for consumers. The presence of certifying agents (such as, UTZ CERTIFIED and Max Havelaar) and the rapid development of organic sector have also contributed to strengthening the Dutch position as frontrunners in the sustainability debate. Where is the knowledge based? the people with knowledge tend to depart for those locations with concentrated R&D. To guarantee sustainable cocoa consumption within a period of 15 years. To deliver a significant contribution to a global sustainable cocoa economy (people, planet, profit). In addition, the ChocoWorkGroup has drawn up a National 10 Point Plan, which includes developing a global framework for sustainable cocoa, creating support for sustainable cocoa within the European Union, and developing a basis training package for farmers. An action point to consolidate the Dutch knowledge base on sustainable cocoa is also part of this plan. Thanks to Juan Pablo Buchert (Nahua) for the pictures.